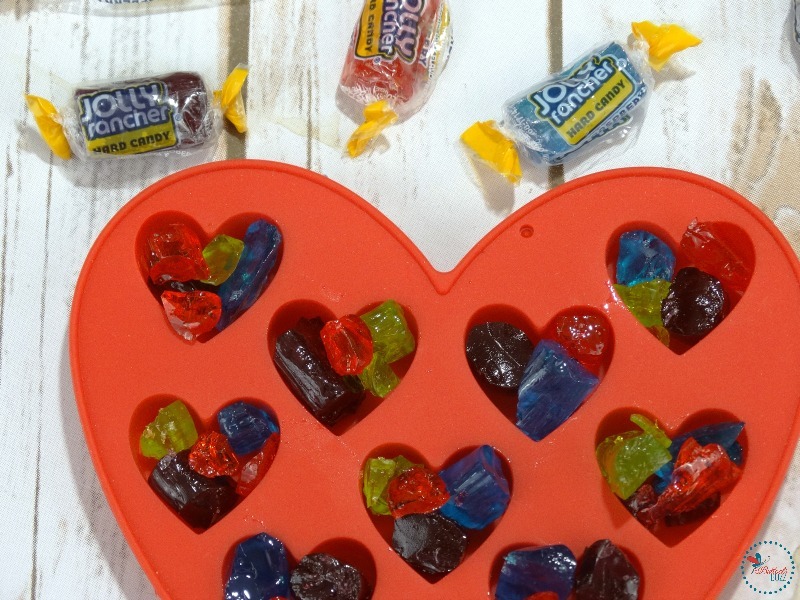 Homemade Jolly Rancher Rainbow Hearts - Perfect for Valentine's Day! 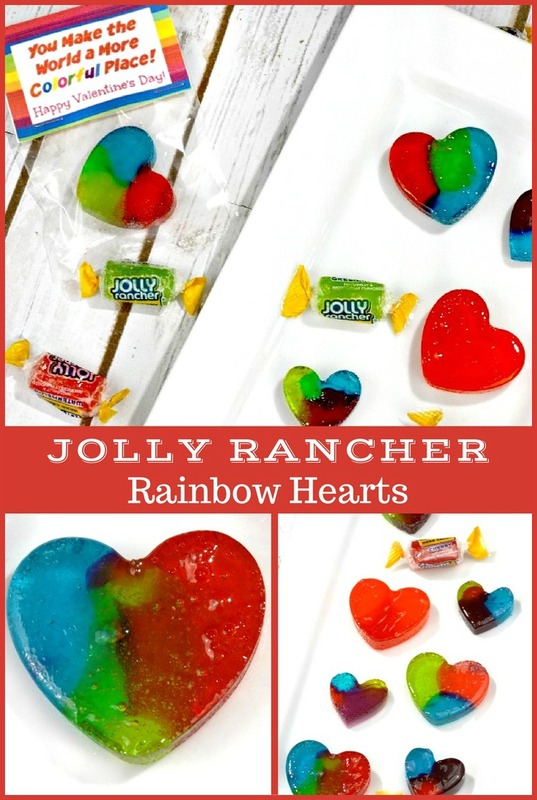 Homemade Jolly Rancher Rainbow Hearts – Perfect for Valentine’s Day! What could be better than Valentine’s Day candy? 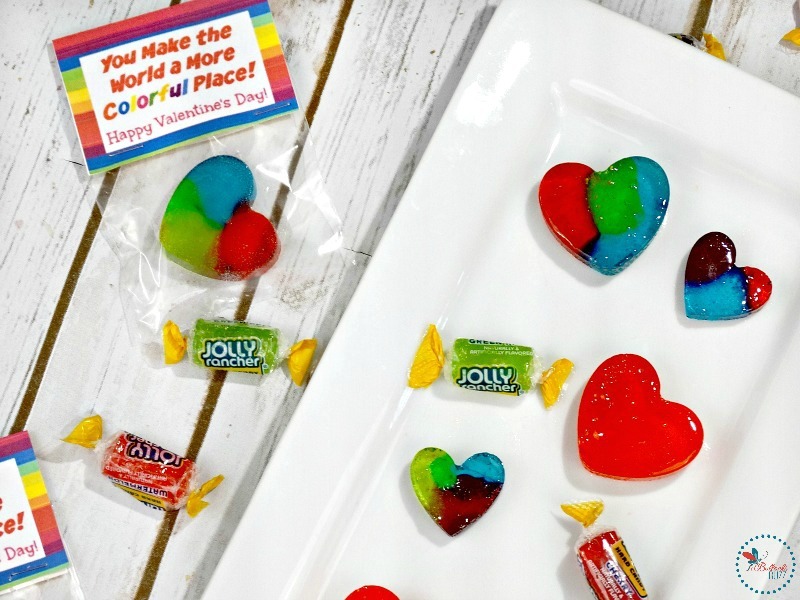 Homemade Valentine’s Candy – more specifically these delicious – and oh, so pretty – homemade Jolly Rancher Rainbow Hearts! Who would’ve thought that making Jolly Rancher Rainbow Hearts would be so easy? You can make these adorable candies with just one ingredient. Yep, just one! Bonus…since they’re heart-shaped, they are perfect for Valentine’s Day! Especially when paired with my adorable Valentine’s Day bag topper (get the free printable bag topper below)! Kids and adults will love the way these candies taste. And they look so neat, too! In fact, they are so colorful and pretty, you almost won’t want to eat them – almost! Before we get started making these yummy candies, I have a few words of wisdom I learned the hard way! One, if you live where it is humid, the hearts are most likely going to be a bit sticky! Unfortunately, there is not much we can do about that other than try to make them on a day where the humidity is on the low side. If not, no worries! They’ll still come out just fine, just be sure to provide some wet wipes for sticky hands! Or you can let them sit out overnight, and once the humidity drops, they’ll be less sticky. Second, if you choose to use the smaller heart molds, I found it works best if you break the candies into pieces first. I’ll explain better in the instructions below. And last, but not least, make sure you alternate colors to get that cool stained glass effect, and fill them all the way to the top because they will shrink down to half the size after melting in the oven. So, are you ready to see just how simple it is to make these fun stained glass candies? (To purchase any of the necessary items, just click them in the above list. These are affiliate links so if you make a purchase using them, I’ll make a small commission, but at no extra cost to you). 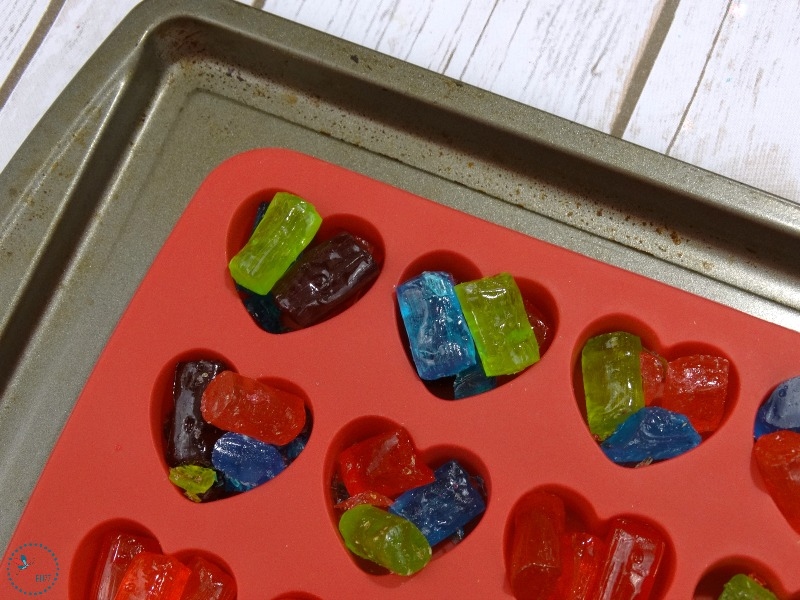 For larger heart molds, fill each cavity with 4 – 6 Jolly Ranchers, remembering to alternate colors for that awesome stained glass effect. For smaller heart molds, it works best if you smash the candies into pieces. Just unwrap the Jolly Ranchers and place them in a plastic snack bag (I used one color per bag). Close the bag, making sure to push out any extra air. Then hit the candy with a mallet or hammer until it breaks up into small(ish) pieces – similar in size to what you see in the photo above. 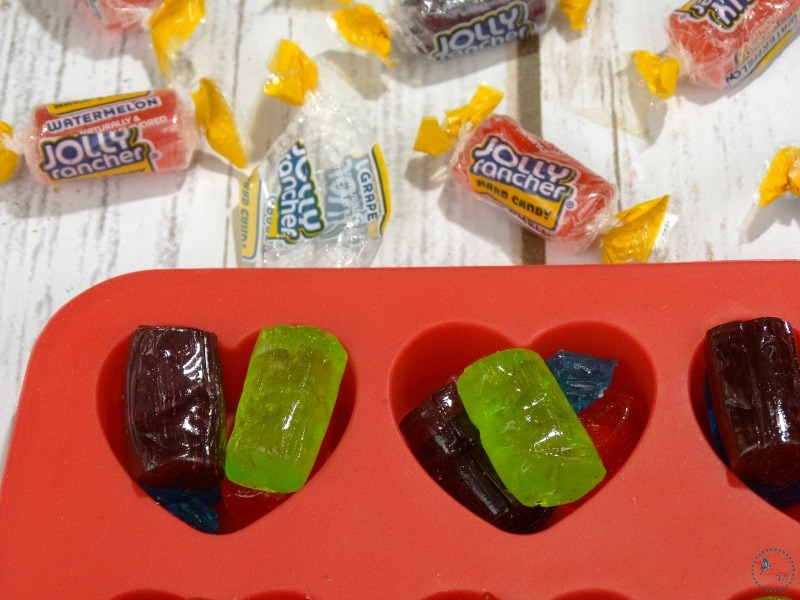 Open the bag back up and place the Jolly Rancher pieces into the mold. Place the silicon mold on a cookie sheet and put it in the oven, baking for approximately 7 – 9 minutes. 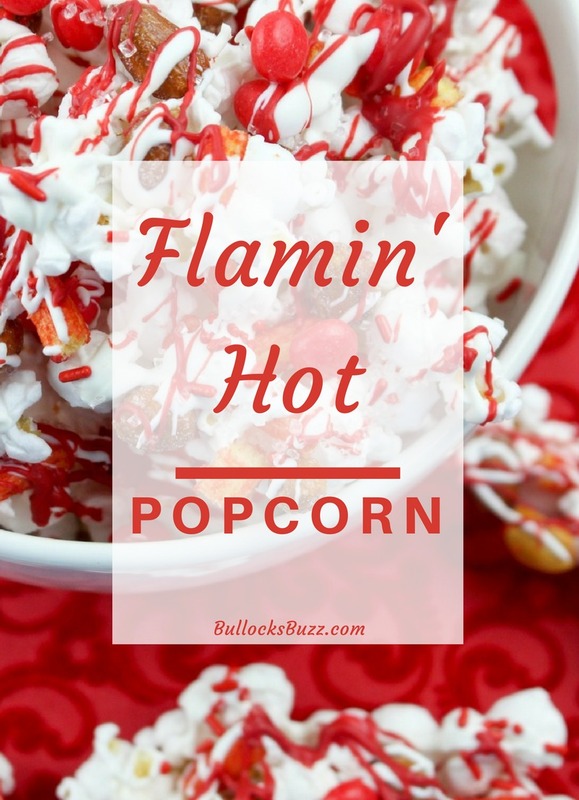 Make sure you watch the oven because the melting can take place quickly and you are going to want to remove the mold when the candy is all melted, but before it starts to bubble. Tip: if you do get some bubbles, just use a metal spoon to tap them out. Once the candy is melted, remove them from oven and let cool completely in the mold. Then, once the candy is completely cool, remove them from mold. Pair with my free printable Valentine’s Day bag topper (click the link to download)! And enjoy! 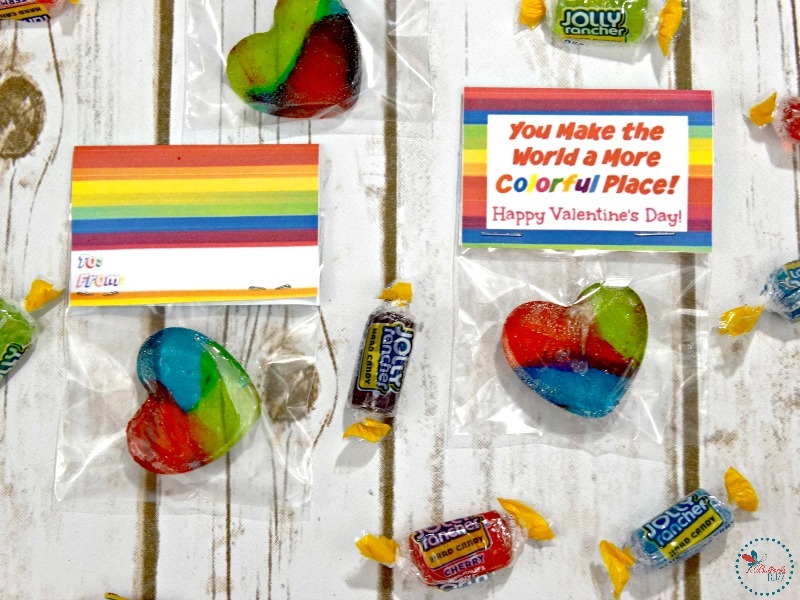 These fun and colorful Valentine’s Day treat bag toppers are the ideal match for the Jolly Rancher Rainbow Hearts.  They are incredibly easy to put together, and cost much less than store-bought ones! You can print them right at home using an inkjet or color laser printer. There are four (4) bag toppers per page, and they are designed to fit snack bags that measure 3 x 4 inches. You can find these treat bags at Michaels for less than $3.00, although I’ve also seen them at Walmart, Hobby Lobby and online at Amazon. To put the Valentine’s together, download the bag toppers and then cut them apart. Once you have the four individual treat bag toppers cut apart, let your child fill out the ‘To/From’ fields on the back side. From there you simply fold each treat bag topper in half, then staple it to the top of the bag. And there you have it, an extra sweet, extra colorful Valentine that everyone will ‘love’! 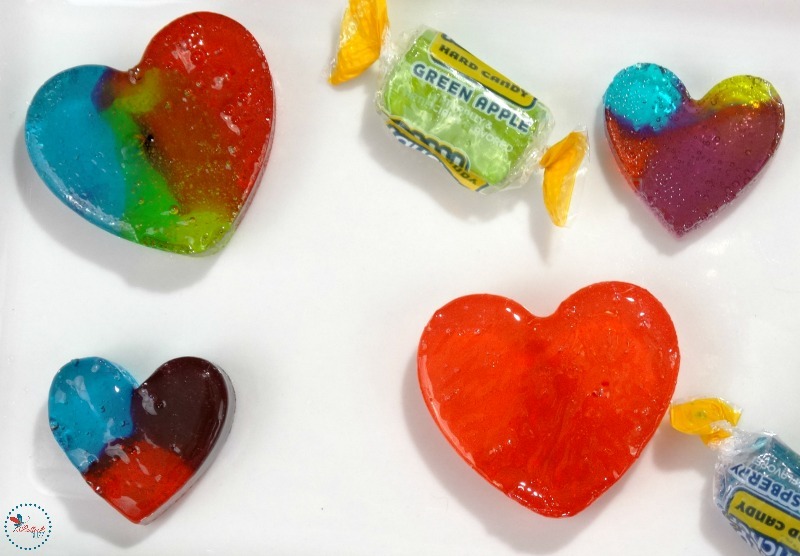 Words of Wisdom: remember, these Jolly Rancher Rainbow Hearts can be very sticky if they are made on a humid day. This can make it difficult to get them into the small treat bags – I found this out the hard way. I was finally able to make it work by placing the candy in the freezer for several minutes, then quickly putting them into the treat bags. 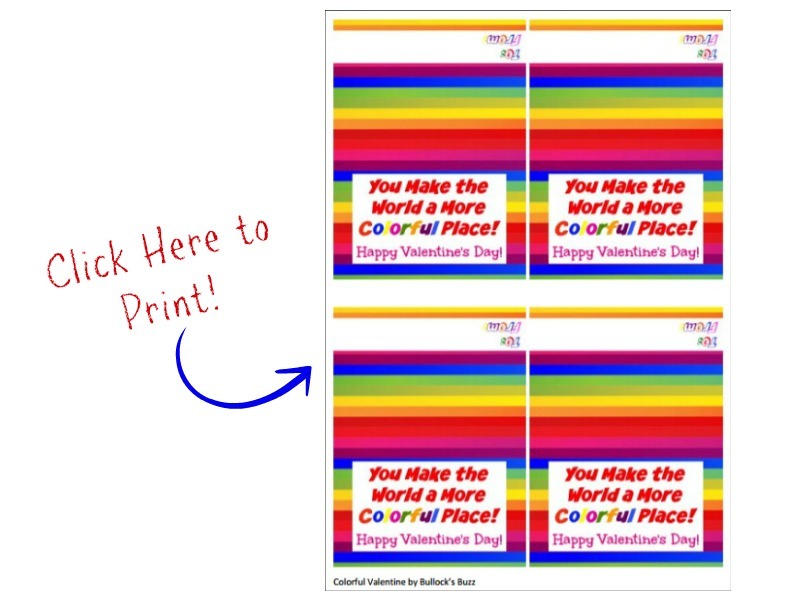 🙂 An alternative Valentine’s Day idea is to use this printable with a bag of crayons! How cute is that?! Enjoy! If you like this idea, be sure to share it by using the share buttons below the title! And I’d love for you to become a fan of Bullock’s Buzz on Facebook to stay up-to-date with our latest freebies and projects! Do you have a favorite homemade candy recipe? Share with us in the comments below! Love this post? Here’s another Valentine’s Day post I think you’ll like! *Bullock’s Buzz’s free downloads and printables are for personal, non-commercial use only. If you have a commercial inquiry, please contact me. Thanks Dan! They taste amazing!